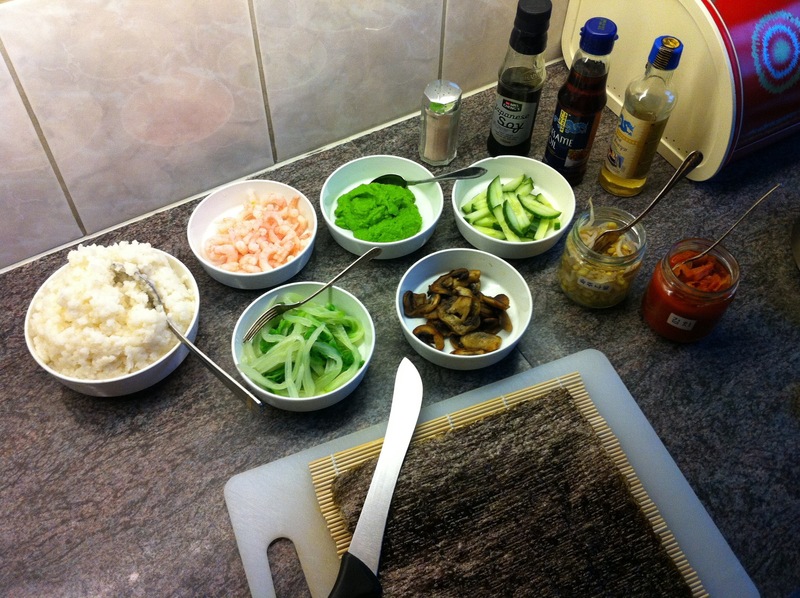 Decided to make some sushi for me and my little sister for dinner. One single problem – no fish at home. 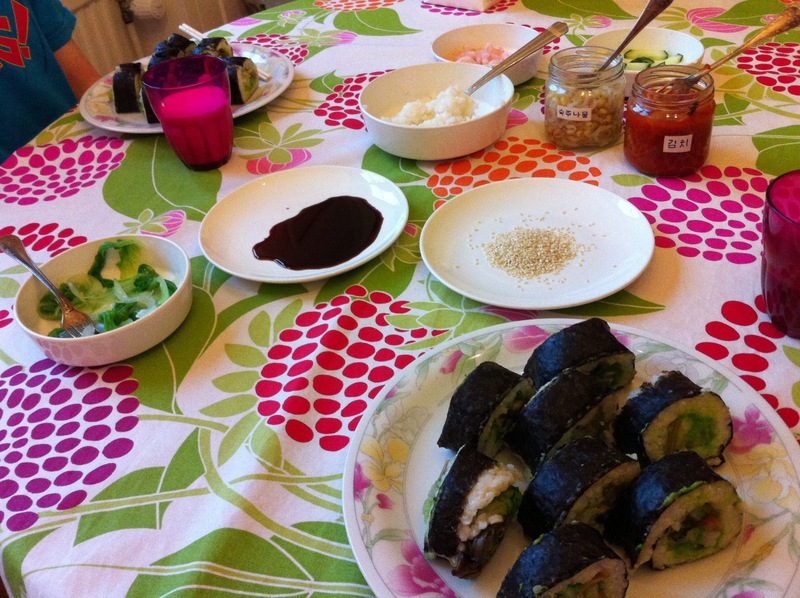 Therefore I made sushi, in a kind of Korean style. Like kimbap, but less Korean. She loves mashed green peas, so I made some – to replace wasabi. We also had champignons, shrimps, some parboiled bok choi, cucumber and kimchi! Will rehearse some biology, pack a bag for the weekend and after that – SLEEP!! So, (most boring way ever to start, think It’s even kinda illegal… In typing-world that is) but – (ok I know, also boring). Anyhow… (naah, I don’t like that), however (that’s it! I feel like wearing a moustache! ), I’ve been having quite a lot to do the past days – I’ll tell you! Thursday, which is today (for me at least), means homework and rest. Homework since… since… (ok I don’t know exactly why, I just do it) and rest, because of tomorrow. Friday, which is tomorrow, I’ll run five kilometres (PE) in school. It’s an annual thing we do every spring but this time will be my last. I’ve decreased my time markedly since the first time and… my teacher uses me as an example when speaking about improving ones condition (I’m proud!). Therefore (and because I hate loosing, it would be a loss to not get a better result) I have to get a better time tomorrow! Kimchi is a korean accompaniment to food. It is basically; fermented vegetables with red chili, garlic and sometimes ginger. The most common type of kimchi is based on chinese cabbage, but there are all kinds of variations, with radishes, leek etc. 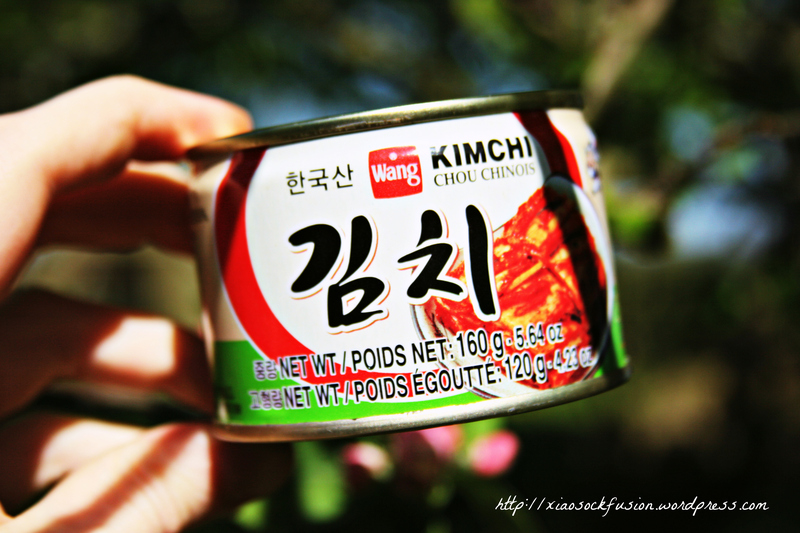 Korean people eat it, together with almost everything and anything. You could say, that it is used like sweet chili sauce or soy – either as an accompaniment or as an ingredient in dishes. There are even dishes specially made with kimchi, like kimchi stew (kimchi jjigea 김치찌개) or kimchi pancakes (kimchi buchim 김치부침). I only ate half of it, so I put the rest in a small glass jar – which there has been swedish “sill” in once! Glass jar changes nationality in half a second, from pure swede to real korean in an instant! I’ve grown up with IKEA. My first real bed was named VIKARE. When writing this, I’m sitting in a SKRUVSTA chair, laptop on a VIKA desk-solution which stands next to my RAKKE bed with a SULTAN mattress, on top of which there is a KRYP GRÄS blanket and behind me is, of course – a BILLY bookcase. I’m so damn swedish! XD Completely surrounded by IKEA furniture. Why? This has recently come to my knowledge. Actually, I got to know about it just an hour ago, watching morning TV. There has been rumours about where IKEA gets their wood. Therefore a swedish tv-team went to the old forests of northwestern Russia, to find out if the rumours were true. They were, of course. So, even though IKEA are marketing themselves as an environmental-friendly company, saying their wood isn’t harming the environment, even though they’re friends with both the FSC*and WWF** and so on – they’re actually cutting down (CHOP! CHOP! ~tree screaming AAAAA!!!) forests as old as 500 years, at this very moment. Let me introduce you to Karelia, the place where the swedish tv-team went. Here we have beautiful, untouched nature, with trees that has been standing here since the last ice-age. Forests like these are not supposed to be cut down. 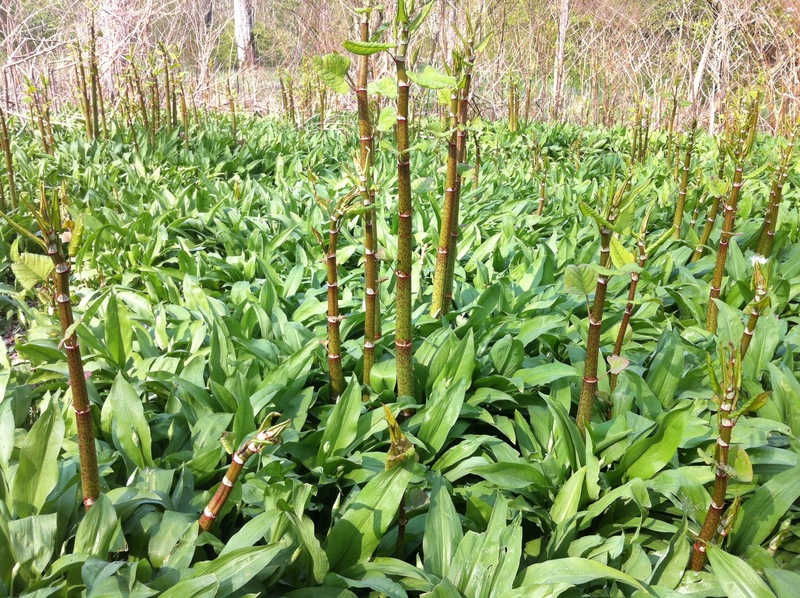 Forests like these are not just popping up every now and then and they’ve become a rarity. The forests of Karelia, are like the rainforests, which you’ve heard of for sure. They are both homes for hundreds of different species, living in a special balance – the only difference is the location and type (there are not the same tree-types etc.). Most of it is russian territory. 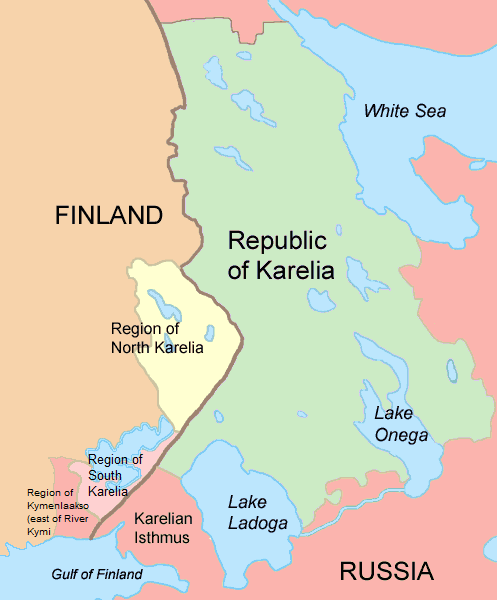 The republic of Karelia is located in Russia, which means that it's owned by the russian government. The russian government lets IKEA rent parts of Karelia and cut down forest there. For more evidence and pictures – go visit protect the forest here. It is a cruel crime against nature, against ourselves in the long run, to do something like this. We can’t just cut down all forests just because we want new furniture, trees are what provides us with oxygen. No oxygen = no humans and then new furniture doesn’t even matter anymore. It is not just about cutting down the forests. See, Swedwood*** moves around. They go to a forest, hire locals who cut down the forest for them at a pretty small cost and then they leave with the wood, ready to go to the next forest and do the same thing. What’s left then? Clearcuts and people with no jobs. What are they going to do? There can’t be any tourism because the forest is gone and there can’t be anyone maintaining the forest because… it is gone. Why do people agree on doing this job then? Well – they had a tough life in the first place, but IKEA/Swedwood doesn’t give a damn about that, no. *** Swedwood is a “Daughter-company”, meaning an underlying/associated/affiliated company to IKEA. IKEA says that they know what Swedwood is doing and that it is not desolation, instead they claim that Swedwood has developed responsible forestry in the area. Not exactly what’s shown in the pictures, right? If you’re against this, perhaps shivering a bit like I did when seeing the pictures, there are things to do. You can go to protect the forest and sign here. It is probably the easiest thing to do as a regular consumer. Only 10% of the ancient forest in Karelia remains, this has got to be stopped. Note 1. As you can see the pictures are not mine. Contact me if there are any problems with this. Note 2. See! I had to make a completely new category for this! Yeah, now I’ll bring strange people to this blog. People who want to take a closer look at this gruesomely gross picture. 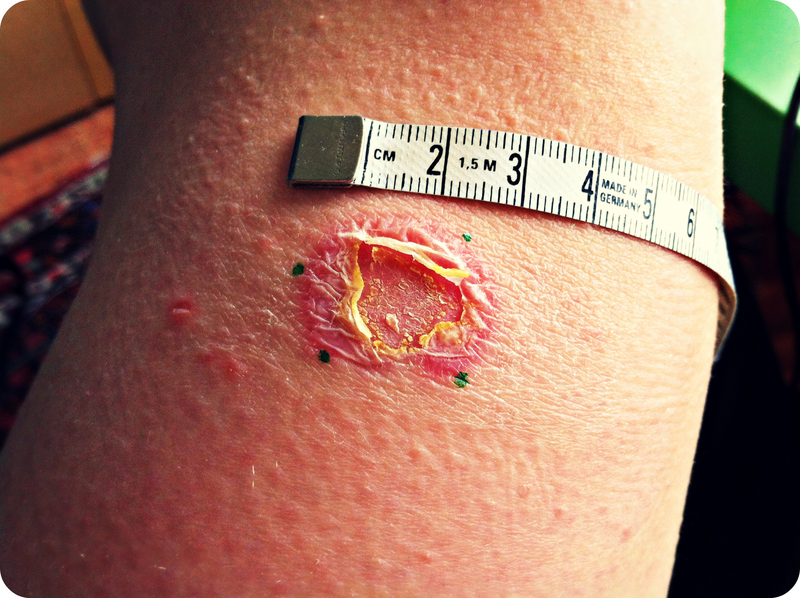 The kind of flat area in the middle is where the blister was.. the rest is how much it grown since… again.. ewwww… and it’s like… STUCK.. no.. it .. it… IS ME … EWWWW….. and the stupid care centre only gave me BAND-AIDS.. uhh. Don’t worry about the green spots – I made them with a permanent marker, so that I can see if it gets bigger…. This weekend I went out hiking with my scout patrol. 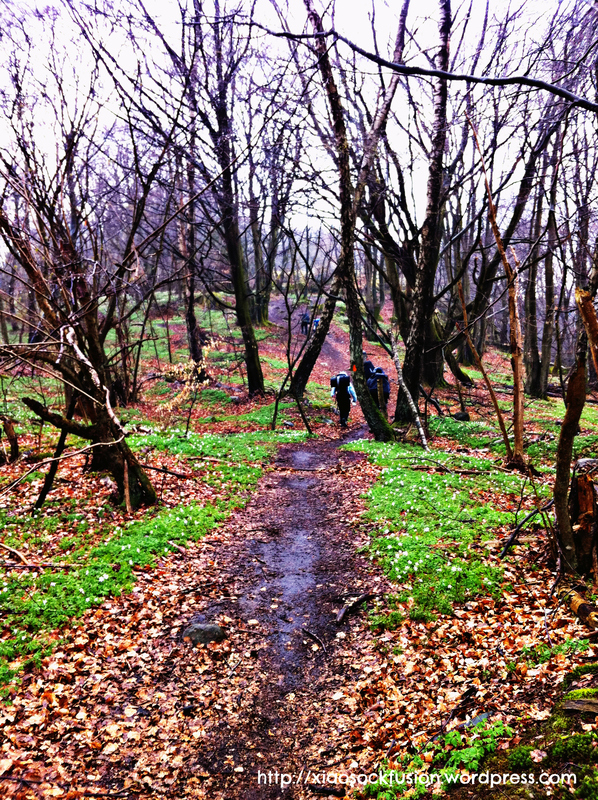 The weather was nice when we left but half an hour after we started walking… the rain came. Pouring down, cats & dogs, sheep, flamingos – everything. The hood on my jacket saved me from drowning and I had a cover for my backpack (Granite Gear Vapor Meridian Ki) but… there was nothing shielding my legs from the rain, since I was wearing jeans. I was soaking wet, as the bandage on my knee.. that unexplainable wound, hm. Several kilometers of walking , up hills and down the hills again, later we ate lunch under some fir trees* the others ate tortellini and me and a friend had some goulash soup with macaroni :). Eating outdoors is always so different from eating indoors, especially if you’ve been working/walking/running etc. – you have more appetite, also things taste better. Could be something with all the oxygen in the woods, I don’t know :P.
We continued our walking and eventually we arrived at the place where we were going to sleep. Now, most people probably think of tents when sleeping outdoors is mentioned. Now, that is too much indoors for a scout. 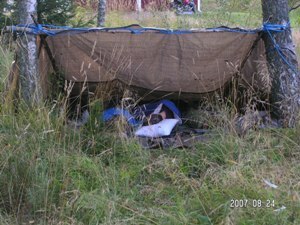 We sleep in “vindskydd“, “weatherbreaks” which is “half a tent” you could say, it protects us from the rain and the wind as well (if it’s positioned correctly). We find fallen trees, preferably very thin (no more than 20 cm diameter, base) and tie some to trees we’ve chosen (I can’t explain the construction since it’s something you learn from watching). Then we throw a big piece of tarpaulin over our “vindskydd-skeleton” and tighten it up (so that rain-water can’t make seas and lakes in sinkages). One side is wide open, this is how we sleep. Of course we have inflatable matresses, pillows and sleeping bags. But, it is still cold outdoor air we’re talking about and we’re in Sweden – so temperatures can sink pretty low. 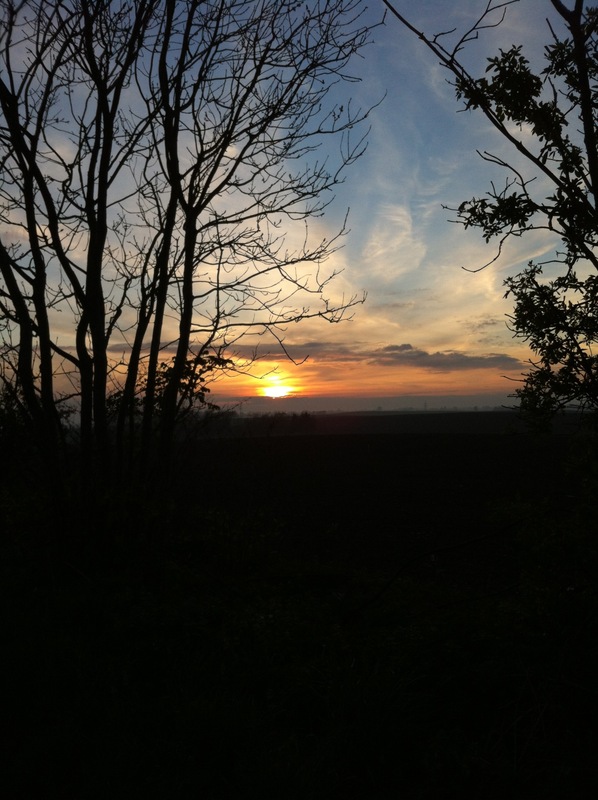 This time, april, it got down to about 3°C or almost 0°C. It was cold, REALLY cold. I know, because my sleeping bag isn’t working. I lied there, keeping myself awake so that I could keep on moving my toes about** and stretching my legs.. I got terrible cramps since I couldn’t stop shivering. I sound querulous, don’t I? 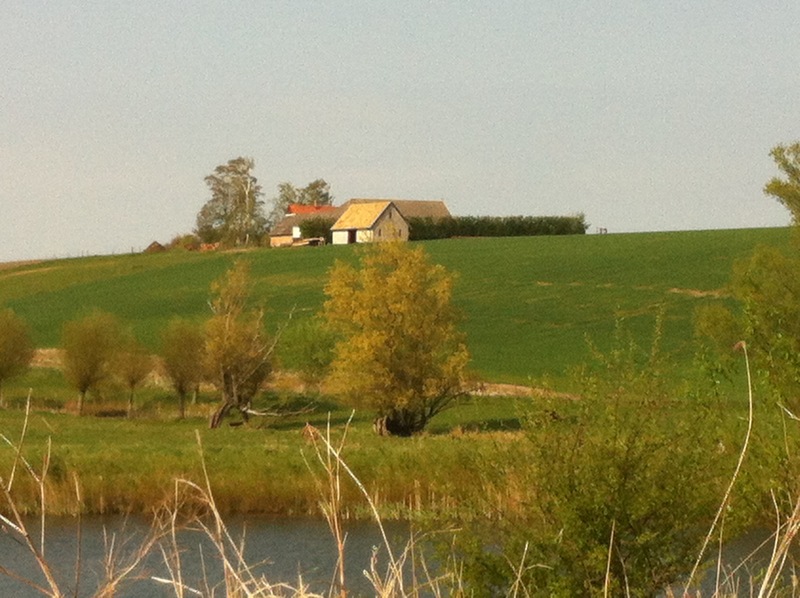 Well, when it was about 5.20 I got up and went to the “vindskydd” where my little sister was sleeping. Luckily, her sleeping bag was big enough to contain us both (and she’s nice enough to let me sleep there). Thank you Selma! :). Later on, we woke up and made breakfast. I cooked some oatmeal and put a package of chocolate oat milk in boiling water.. it was wonderful***… I also ate three sandwiches with jam and.. salami? Well, they had no butter and no cheese… so I pretended the salami was cheese. It worked XD. (marmalade or jam + cheese = awesome). We packed our bags and left the place, heading towards a place where we could eat lunch. This time I ate some tomato-soup… while almost drowning in my own jacket. I was so damn WET and COLD. Could. Not. Stop. SHIVERING!!! However, the warm soup made me feel a little better and we continued walking towards the place were we got dropped off the other day. Eventually we got there and met up with our parents (now I sound like a kindergarten kid). Some say best friends last forever (nothings eternal though), but I’ve seen how so many people betray each other, how they do not care for each other. I might now know about how the future looks, but what I do know is that, my friends are not the kind of people who’d ever let me down. That much I can tell, when we suddently fit four people in a tiny tiny wooden shelter which probably was made for two, or when we’re the slowest patrol, since everyone waits for the injured. That much I can tell, which probably is a lot more than what the party-animals know about each other (nothing bad about parties). * They don’t spread their roots as much as deciduous trees, therefore they stand closer to each other and work as.. a bad umbrella… but still an umbrella! (Not a sprinkler, at least). ** Last time I used this sleeping bag, my toes got really cold. When I woke up I couldn’t feel them anymore and they were all blue. Pretty scary since I was hiking a bit alone that time. *** This is what I’m talking about when I say difference between eating indoors and eating outdoors. There were LOADS of these.. and I don’t even know what they are!